That comment is usually used as a weapon against further exploration of the discussion at hand. Nothing factual is presented to oppose the premise with which one is having difficulty. While the accusation is usually true, it is not sufficient to prove nor disprove anything. Basically, it is evidence of a weak mind not willing to grapple with a difficult task. It is similar to "character assassination" in trying to invalidate the other person's right to their opinion. All of life, however, and our experience of it, is based on an interpretation. 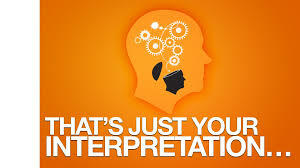 Interpretation is personal, as are our opinions. The problem with opinions is that everyone has one about something. The opinion held may or may not have any basis other than "that is the thought that passed through my head." The true definition of 'opinion'—in street terms is—"an educated guess." Most opinions in the realm of debate about whatever, are not educated guesses, but, rather, simply a knee-jerk reaction arising from something distasteful to the one expressing their so-called opinion. This kind of reaction is, for me, very discouraging when used as a defense against trying to understand scripture. I'm not as bothered by it in the realms of politics, economics, social awareness, religion, theater, film, etc., because those are all of this temporary world. I am not discounting the reality or fact of interpretation or opinion when it comes to the Word. That is certainly an aspect of each one's understanding. What I am trying to point out is the need for a more mindful approach to discovery in the Bible. When someone says something with which you disagree, do not go immediately to "that's just your opinion." What would be the danger in trying to discover why they believe what they do? you do not really know. The emphasis is on proving things to be true, not trying to prove them wrong. That is easy to do. People love to take "soundbites" from something and elevate that to the place of their full understanding of the person, which can be used either for agreement or disagreement. For instance, I can use the Bible to prove that suicide is a recommended form of death. Judas hanged himself (Mat. 27:5) and Jesus said to go and do likewise (Luke 10:37). Those two thoughts are soundbites put together out of context to make a point. People often grab something out of the context in which it was spoken to prove the person with whom they disagree is a villain. Of course, it is rather simple to disprove my silly little illustration, but hopefully, you get the point. Soundbites are NOT the way to prove nor disprove anything. "That's just your opinion" is a soundbite. Great catchy article. I was expected something very different when I read it...but good point in calling out soundbite theology. Thanks. It is a problem in the Body of Christ, but thankfully, not something we are dealing with in our fellowship. Why not know WHY they believe as they do. Excellent point.